Annnnnd the 2017-18 NBA Season schedule is out!! The NBA schedule was released Monday evening and the dates are set for the Atlanta Hawks. The Hawks will open with five consecutive road games with the season kicking off in Dallas October 18th against the Mavericks. Atlanta’s first home game will be on October 27th against the Denver Nuggets and a familiar face, All Star Power Forward, Paul Millsap. Millsap was in Atlanta between 2013-2017 was one of the star players for the organization and after four years, he departed as a Free Agent after the Hawks didn’t offer another contract extension. In the Hawks Martin Luther King Day home matinee, they will face Western Conference powerhouse, the San Antonio Spurs, and if the Hawks could give their fans an exciting game like we saw on New Years Day, it would be a great experience for the True Believers!! 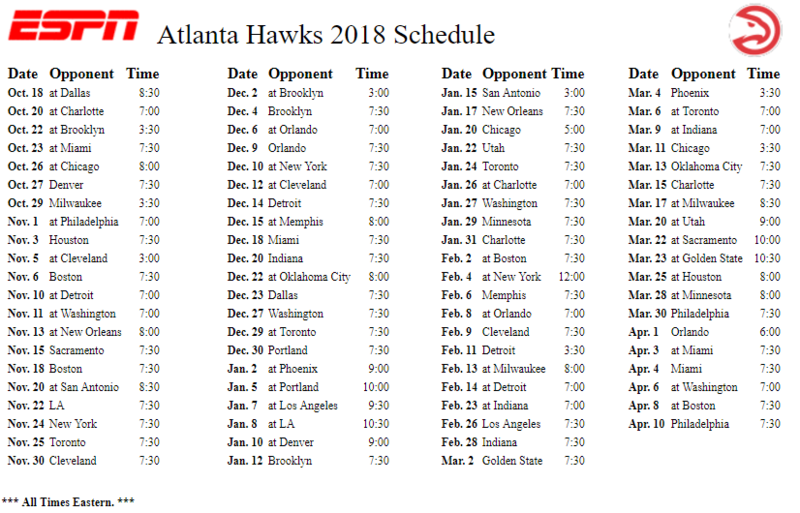 The Hawks didn’t receive a Christmas Day game and only have two National TV games this season, which partially is due to the lack of household names and the organization going through a potential rebuild. Despite the lack of media attention, there are a few notable games for Atlanta Hawks fans to watch this season!!! The Nuggets’ brass feels they are close to making the playoffs after acquiring Paul Millsap. In the home opener, Millsap will return to a fan base that had grown to love (Sometimes to a fault). Personally, I wanted the Hawks to trade the All-Star a few years ago for young assets and Draft Picks; unfortunately, Millsap bolted (for nothing). It’s the Hawks fans first chance to either welcome their former beloved or show their displeasure with his departure (which perhaps should be equally directed toward the front office). This is the first high emotion game of the season for what could be a sluggish start to the season. This will be the first of four meetings this seasons of two teams that don’t like each other. The Wizards and the Hawks played a physical and emotional series in the First Round of the NBA Playoffs where there were a few physical exchanges between the teams (Google ‘Crybaby’ and Markieff Morris). Though Millsap is no longer with the Hawks, there may be a new rivalry afoot, I’m interested to see if it actually blossoms into the regular season. The 71-million-dollar man, Tim Hardaway Jr. and Kristaps Porzingus roll into Phillips (my assumption is that Carmelo Anthony will be elsewhere) for Hardaway’s first visit against his old team after the Knicks made an offer he couldn’t refuse as a Restricted Free Agent. The Hawks and Hardaway Jr. agreed to move on after the offer. The consensus around the league was that the Knicks overpaid, here’s the first chance for the Hawks to be bitten by the decision. MLK Day and the Atlanta Hawks, it just works. Growing up in the state of Georgia there was a lot of pride being able to live close to the legacy of Dr. Martin Luther King. As a young sports fan, a day of service and walking to the Hawks’ game or turning to an early tip-off was a tradition. I’m happy that this tradition is back in Atlanta, it’s one I look forward to every year. Big Baller Brand is coming to Atlanta. I want to see what the highly decorated rookie Lonzo Ball is capable of. Lonzo Ball vs Dennis Schroder could be one of the intriguing point guard matchups of the year as both play a flashy pass and shoot style that could result in solid stats on the scoreboard! The Hawks should have an identity at this point in the season, and we’ll be intrigued to see if the Hawks are a borderline playoff roster or a Top Draft Pick.